If you’re already the proud owner of one of our luxurious whirlpool baths, you’ll know that they’re all about indulgence – made all the better by just the right mood. Whether you’ve hand-picked every element of your bathroom’s interior design, or you’ve not thought about it too much just yet, lighting is one element that can really bring it to life. At The Whirlpool Bath Shop, we’ve naturally had many years of experience crafting bathrooms, so we like to think we know what works and what doesn’t. That’s why we thought we’d list a handful of ways that you can use lighting in combination with your whirlpool bath to create the perfect mood. Believe it or not, the human race has been using coloured lighting to relax for centuries. Back in Roman times, coloured panes of glass would be installed in the solariums so that when the sun beamed in, softly coloured light would fill the room. This same concept still lives on today – and by combining it with the relaxing nature of your whirlpool bath, you can discover the secret to ultimate relaxation. With an underwater lighting system fitted to your bath, you can enjoy the mood-boosting and stress-busting benefits of soft lighting blended with the warm, luxurious bubbles of the jets. Here at The Whirlpool Bath Shop, we’ve whittled our offering of underwater lighting solutions down to the absolute essentials. If you just want to be able to choose any number of colour-cycling lights to be built in to your brand new whirlpool bath, the Fade Chromotherapy Light is an ideal choice. It gently fades from red to blue and every shade in between, lighting the water in hypnotic ways. Installed in much the same way, these lights can be set to shine just one colour – and are available in kit form so you can add them to your existing whirlpool bath. Handy, eh? Finally, for those looking for all-in-one solutions, we have a full 10-light Chromotherapy Mood Lighting System that’s truly the ultimate in mood lighting indulgence. Mood lighting is one thing, but what about sound? Many people take sound docks or other items into the bathroom, but this isn’t always the safest solution. That’s why we offer an innovative sound system for your whirlpool bath. 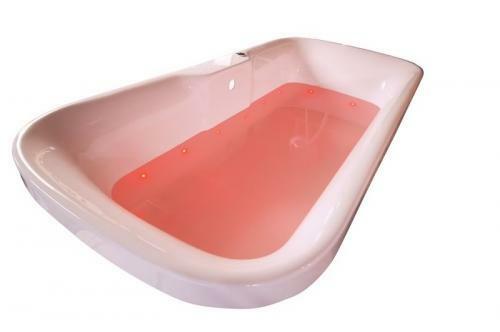 Available in three different flavours, these systems combine the relaxing nature of the chromotherapy underwater lights with a fully comprehensive sound system – so you can really feel your music as you’re taking the weight off in the bath. Just imagine floating in beautifully warm rainbow-tinted water while your favourite song engulfs you – it’s possible with this system. 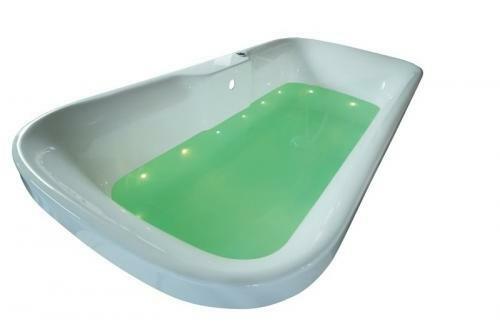 Are you sold on the benefits of underwater lighting in your whirlpool bath yet? If not, we’d very much recommend looking into these systems in more detail. For the definitive whirlpool bath experience, we always recommend underwater lighting – so why not discover why for yourself first-hand?